Warren Buffett's net worth increased by $11 billion in 2016 -- a performance that surpassed all his billionaire peers. 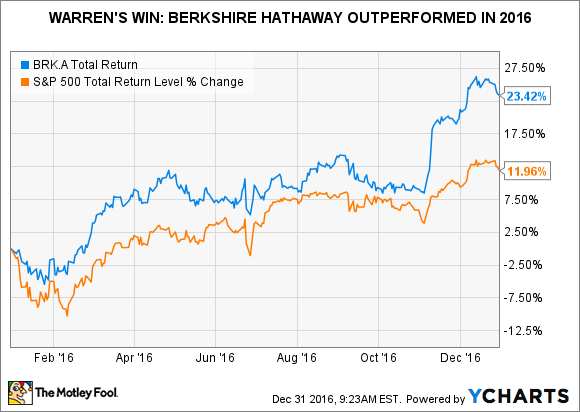 To explain that performance, other numbers illustrate two of Berkshire Hathaway's "Owner-Related Business Principles." Eleven billion dollars. That's a number Berkshire Hathaway Inc. (NYSE:BRK-A)(NYSE:BRK-B) CEO Warren Buffett, who has been obsessed with quantifying things since childhood, ought to appreciate. It's the increase in his net worth in 2016, according to the Bloomberg Billionaire Index -- that's an average hourly rate of accumulation of roughly $1.25 million! Another fact may appeal to Buffett's competitive nature: He surpassed all his billionaire peers in terms of the dollar increase in his net worth. Beyond these headline figures, however, there are other numbers – and business principles -- that say more about how he achieved his uncommon success. The following table shows the five billionaires who scored the largest dollar increases in their net worth in 2016. I excluded members of the Mars family, because their wealth is inherited and because Mars is a private company. *At Dec. 28, 2016. Data source: Bloomberg. Names like Buffett, Gates, and Bezos are inextricably linked to the companies they founded: Berkshire Hathaway, Microsoft, and Amazon.com. Strictly speaking, Warren Buffett didn't found Berkshire Hathaway; he acquired a majority interest in a declining textile business. However, his stewardship of Berkshire over the past half-century has transformed the company to such a degree that the question of whether he founded it is academic. The same is true of Bernard Arnault's LVMH Moet Hennessy Louis Vuitton. *Estimated. Data source: Bloomberg; author's calculations. 2. In line with Berkshire's owner-orientation, most of our directors have a major portion of their net worth invested in the company. We eat our own cooking. Charlie's family has 90% or more of its net worth in Berkshire shares [that's Charlie Munger, Berkshire's vice chairman]; my wife, Susie, and I have more than 99%. In addition, many of my relatives -- my sisters and cousins, for example -- keep a huge portion of their net worth in Berkshire stock. *Estimated. Data sources: Bloomberg, Forbes, author's calculations. 10. We will issue common stock only when we receive as much in business value as we give. This rule applies to all forms of issuance -- not only mergers or public stock offerings, but stock-for-debt swaps, stock options, and convertible securities as well. We will not sell small portions of your company -- and that is what the issuance of shares amounts to -- on a basis inconsistent with the value of the entire enterprise. Refusing to diversify his stock portfolio for the sake of diversification, being a business-focused investor and a value-conscious owner: Those are some of the key traits that, along with the powerful effect of compounding, have set Warren Buffett up to make staggering wealth gains. Of course, what the stock market gives over the course of 12 months, it can easily take away over the next 12. But that doesn't mean wealth is illusory; at roughly one and a half times book value or 20.4 forward earnings, shares of Berkshire Hathaway look fully priced, but not overvalued.